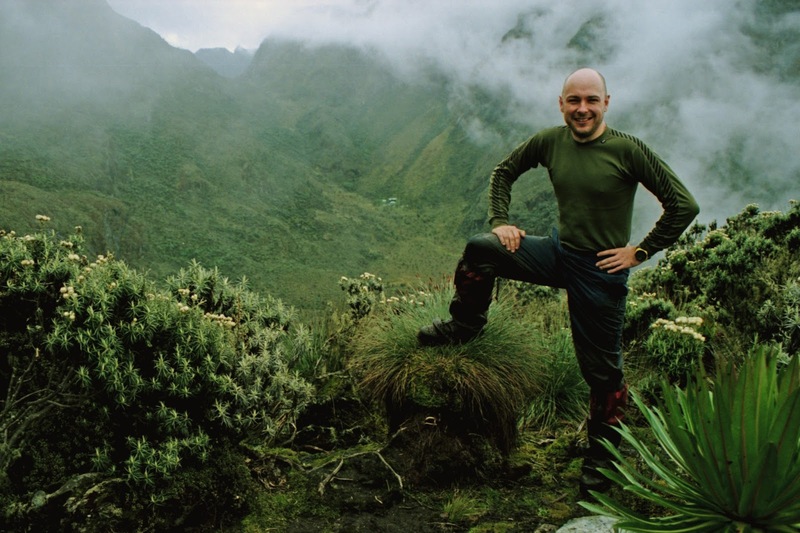 I return to Africa for this blog and an expedition I made several years ago to Uganda. My inspiration was to follow in the footsteps of the great explorers in their quest to find the source of the Nile. 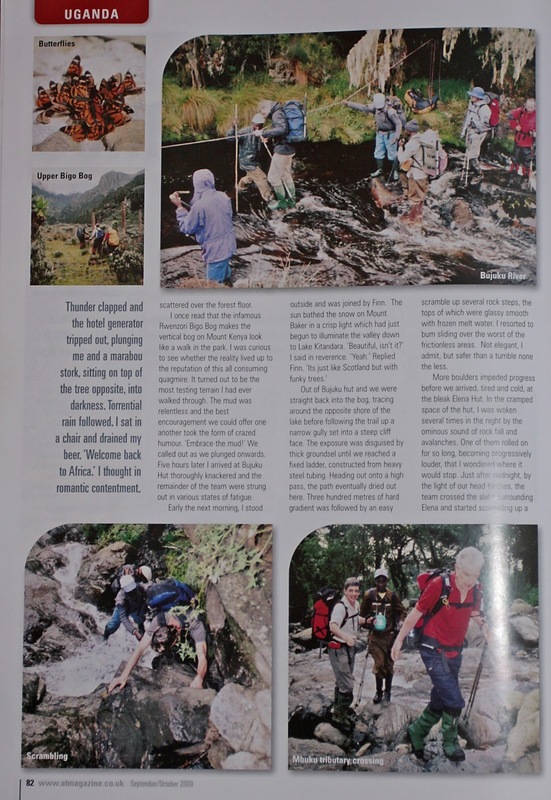 The following feature was printed in Adventure Travel Magazine. Climbed Kilimanjaro? 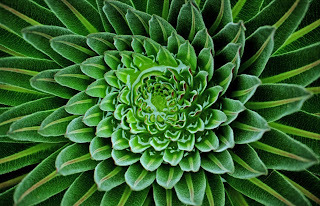 Trekked Mount Kenya? Stared in awe across the Ngorongoro Crater? Then you could be forgiven for thinking that you have experienced the finest that East Africa has to offer. But, if you haven’t visited the Rwenzoris then you have missed one of the best wilderness adventures on the continent. Stu Westfield puts on his waterproofs and sets out in a quest to re-discover the glaciers at the source of the Nile. The position of the Nile’s source has long been a hot topic of debate. For a while, in the 1800’s, it was accepted to be Lake Victoria. 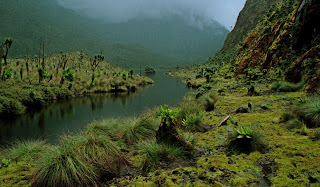 But, if you consider the Rwenzori range acts as a massive reservoir, constantly filling the Victoria basin, then I can argue that the source of the Nile is really on top of Mount Stanley. 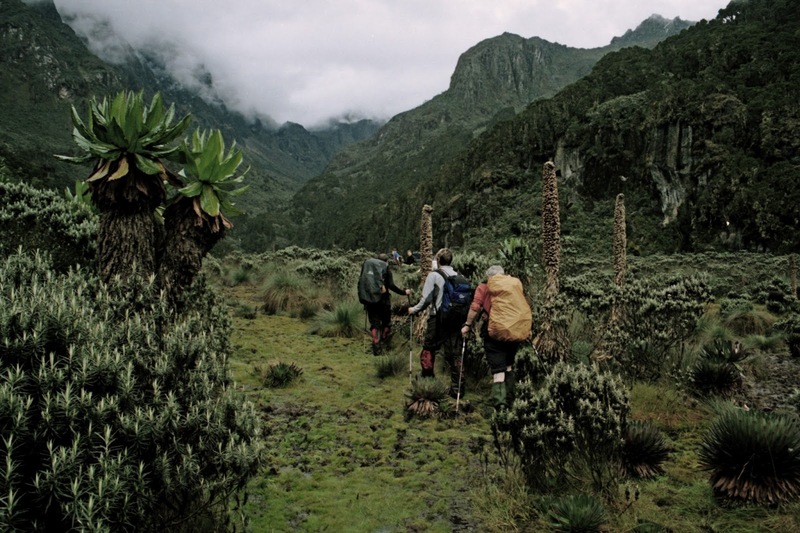 Which is a good thing for us adventurers as the Rwenzori mountains are readily accessible in a two week journey through a lost world of bizarre plants, infamous bogs and remote peaks. Shortly before our arrival in the dusty town of Kasese our mini-bus clattered loudly over a concrete bridge. The river underneath was in full flow, having been topped up by recent storms. ‘Does it go all the way to the Nile?’ I asked our Ugandan driver. I looked across a sea of green papyrus reeds into which the white water magically disappeared. That evening, on veranda of the Margherita hotel, I gazed out to the surrounding hills as the equatorial light faded. A rumble in the sky announced the impending arrival of a thunderstorm. There was a heavy smell of ozone in the air and a couple of minutes later, a bolt of lightning found earth nearby. My irises contracted in reaction to the intense flash. Thunder clapped and the hotel generator tripped out, plunging me and a marabou stork, sitting on top of the tree opposite, into darkness. Torrential rain followed. I sat into a chair and drained my beer. ‘Welcome back to Africa.’ I thought in romantic contentment. All expeditions to the Rwenzori National Park start at the headquarters in the village of Nyakalengija, where my fellow adventurers and I were introduced to our guides and porters. Formalities taken care of, it was only a short walk until we entered the jungle, which grew with a vigorous wild beauty in the saturated soil. Long before we reached a mass of huge granite blocks deposited on the banks of the Mubuku river, I could hear the roaring noise of water crashing over boulders. It was a sound that would accompany us for most of the trek. 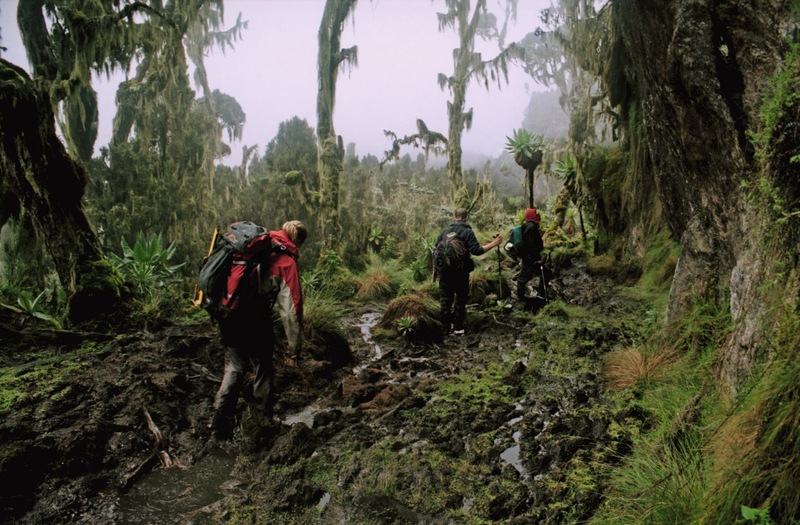 It took four and a half hours to walk the seven kilometres and ascend 1000 metres to Nyabitaba hut. Night arrives quickly at the equator and in the flickering light of a candle there was lively conversation over dinner. But, surrounded by pitch blackness, there wasn’t much else to do before going to bed. 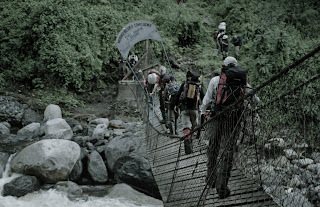 When trekking the Rwenzori circuit each day brings a different ecological zone and new obstacles to overcome. After breakfast, we passed through a dense thicket, stepping over thick roots and ducking under low slung branches. 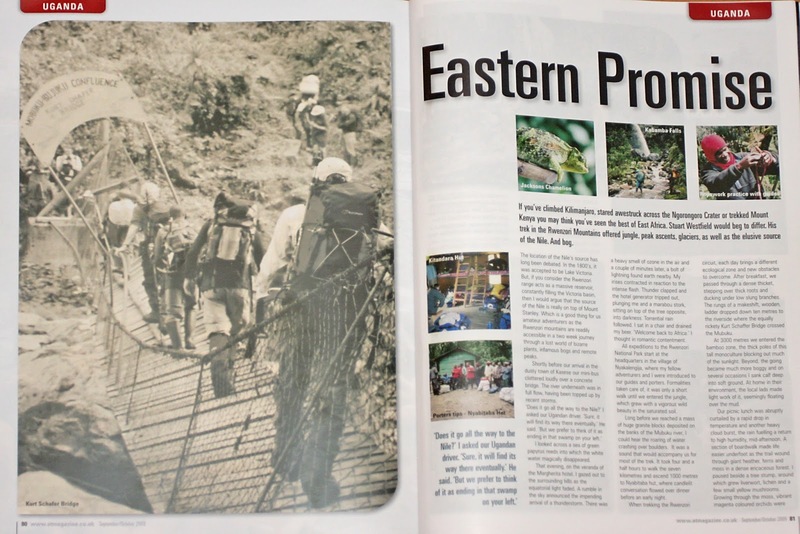 The rungs of a makeshift, wooden, ladder dropped down ten metres to the riverside where the equally rickety Kurt Schaffer Bridge crossed the Mubuku. At an altitude of 3000 metres we entered the bamboo zone, the thick poles of this tall monoculture blocking out much of the sunlight. Beyond, the going became much more boggy and on several occasions I sank calf deep into soft ground. At home in their environment, the local lads made light work of it as they seemed to float over the mud. Our picnic lunch was abruptly curtailed by a rapid drop in temperature and another heavy cloud burst. The rain fuelling a return to high humidity, mid-afternoon. A section of boardwalk made life easier underfoot as the trail wound through giant heather, ferns and moss in a dense ericaceous forest. I paused beside a tree stump, around which grew liverwort, lichen and a few small yellow mushrooms. Growing through the moss, vibrant magenta coloured orchids were scattered over the forest floor. 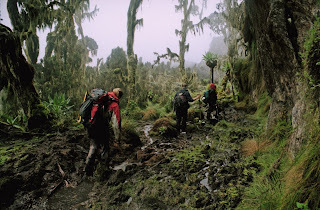 I once read that the infamous Rwenzori Bigo Bog makes the vertical bog on Mount Kenya look like a walk in the park. 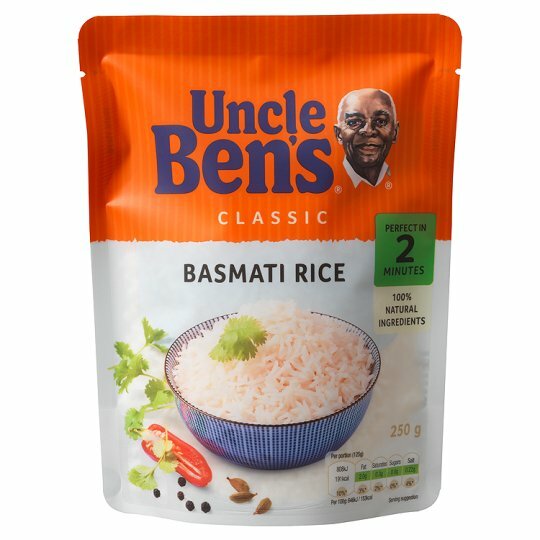 I was curious to see whether the reality lived up to the reputation of this all consuming quagmire. It turned out to be the most testing terrain I had ever walked through. The mud was relentless and the best encouragement we could offer one another took the form of crazed humour. “Embrace the mud!” We called out as we plunged onwards. Five hours later I arrived at Bujuku Hut thoroughly knackered and the remainder of the team were strung out in various states of fatigue. Feeling the effects of the altitude, I had an awful night’s sleep and so got up early in the morning. With a refreshing cup of tea in my hand, I stood outside and was joined by Finn. The sun bathed the snow on Mount Baker in a crisp light which had just begun to illuminate the valley down to Lake Kitandara. ‘Beautiful, isn’t it?’ I said in reverence. Out of Bujuku hut and we were straight back into the bog, tracing around the opposite shore of the lake before following the trail up a narrow gully set into a steep cliff face. The exposure was disguised by thick groundsel until we reached a fixed ladder, constructed from heavy steel tubing. 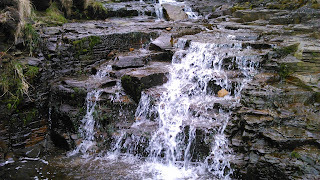 This brought us out onto a high pass, where the path eventually dried out. Three hundred metres of hard gradient was followed by a scramble up several rock steps, the tops of which were glassy smooth with frozen melt water or coated in frictionless lichen. It wasn't the most elegant style with which I negotiated the hazard, I admit, but safer than a tumble none the less. 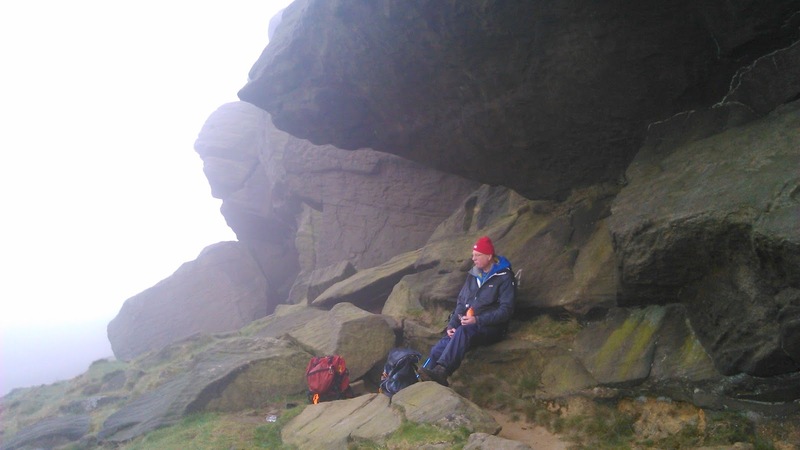 More boulders impeded progress before we arrived, tired and cold, at the bleak Elena Hut. Inside, it was cramped with twelve of us packed into the small space. I was awoken several times in the night by the ominous sound of rock fall and avalanches. One of them rolled on for so long, becoming progressively louder, that I wondered where it would stop. Just after midnight, by the light of our head torches, the team crossed the slabs surrounding Elena and started scrambling up a steep gully. The first thirty metres presented no problems and on the wide ledges I stepped upwards without relying upon the rope. However, our progress slowed as a sheen of ice crystals clung to the face. So, we each tied in with a prussic loop to safeguard against a slip becoming a serious fall. On the straightforward gradient beyond our fixed line, I used my ice axe on the mixed ground, as fresh snow had fallen overnight. The white patches glowed with a blue luminescence where my torch cut into the darkness. Daybreak gave form to several moderately exposed ledges. I paused and remembered I had seen a similar formation on the north ridge of Tryfan in Wales. I worked my way across the rocks, around an outcrop and up onto flat slabs leading to the snout of the Stanley glacier. The rising sun’s rays bounced off it with blinding intensity. 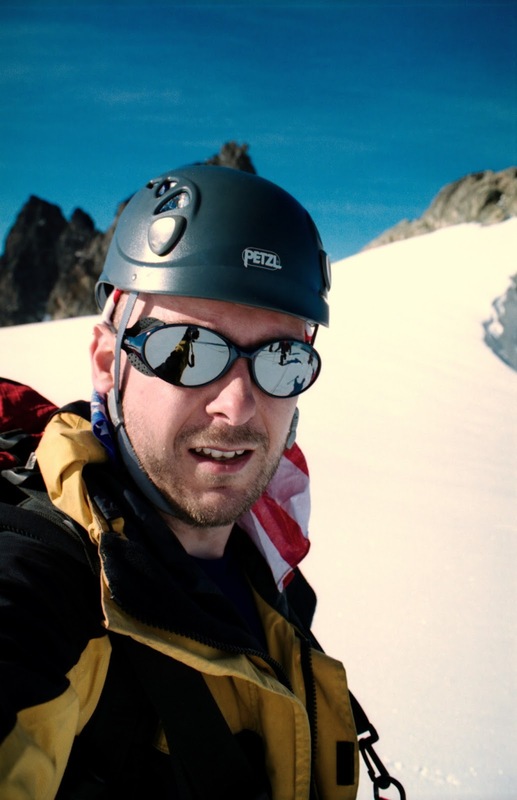 Squinting, I fished out the sunglasses from my pack and sat down to put on my crampons. With excited anticipation, I tightened the straps. A layer of cotton wool cloud hovered below us at four thousand metres. Above, Stanley’s twin peaks of jet black stone pierced the blue above their snow covered saddle. Once on the glacier, there was a half hour of easy walking which lead to a down climb over steps covered with scree. Our guide looked concerned and he called for our attention. ‘There’s a large serac above our route, which is in danger of collapsing.’ He informed us. Usually Mount Stanley is swathed in mist, keeping the temperatures low and the ice solid. The glorious sunrise which had allowed us superb views of the peaks had also left the withering equatorial heat beating down on the high ground. There was no safe option other than to retreat, our crampons points squeaking and scraping on the bare rock as we climbed out of the couloir. But, instead of walking directly down the Stanley glacier we made a small diversion to its crest and hence claimed victory in reaching the highest watershed of the Nile. Here lay the mythical source and our efforts were rewarded with a magnificent view down onto green expanse of the Congo basin. Once off the glacier, we rappelled back down to Elena hut and trekked for three hours via Scott Elliot Pass, the highest point reached by non-climbers on the Rwenzori circuit, to Kitandara Hut: Which was positive luxury in so much as it was windproof, more spacious and had a covered veranda. The sleeping arrangements were still very communal, but once settled, I quickly dozed off to sleep. 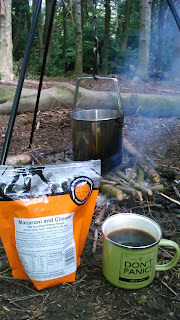 Beside the hut ran a stream, fast flowing over a bed of clean gravel, feeding a tranquil lake. It was a perfect place to rest. The steep hike out took us over icy boulders and above the snowline to Freshfield Pass. Here we found a winter wonderland with scarlet chested sunbirds busy drinking nectar from tall giant lobelia flower spikes. We followed the foaming roar of white water. It came back into view transformed into a vision of paradise. The river had widened, making a soothing swoosh as the crystal clear flow slid over an almost perfectly flat bed of solid rock. For the rest of the afternoon we feasted our eyes upon an inspiring sequence of natural wonders and panoramas which looked like scenes from pre-history. The only things missing from the valley floor were iguanodon browsing on the lush vegetation and pterodactyls flying overhead. The final day in the Rwenzoris began with a steep descent on a muddy path hugging the side of a precipice. The last major hazard was a tower of chaotic wooden ladders. At the base, I saw that our porter team had gathered. They welcomed the arrival of their colleagues and clients with equal enthusiasm, cheering and clapping. The trail was once again bathed in sunshine, so I paused to take off my fleece. In the silence my ears tuned into the natural rhythms of the forest. A chorus of cicadas and birdsong echoing from the canopy brought serenity and calm. Sun dappled light danced over the bushes, chasing a multitude of yellow and tortoiseshell coloured butterflies. At the edge of the park, in an abrupt contrast to the enveloping jungle, cultivated fields and terraces reached high into the hills, showing the changes that agriculture has brought to the environment. Chickens strutted around the rough built huts in Nyakalengija. Tethered goats picked over thin grass, women carried produce and small children ran around playing. Men stood around in small relaxed groups, smoking and watching the world pass by. At the headquarters we parted from our guides and boarded our mini bus for the dusty ride back to the Margherita hotel. 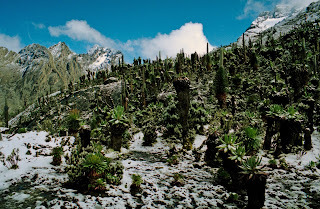 WHERE: Rwenzori National Park, Uganda. ACTIVITY: Jungle trekking, scrambling, glacier travel, safari. TOTAL TIME: 2 weeks or more. Trekking to the source of the Nile is one heck of a ‘top that’ when it comes to answering ‘where did you go on holiday this year?’ It took the best explorers the Victorians could muster, months, if not years just to reach the African lakes. On this expedition you’ll truly be standing on the shoulders of giants. DIFFICULTY: Strenuous trekking at altitude. LOOK OUT FOR: The infamous Bigo Bog. Scenery from a lost world. Glaciers on the equator. GETTING THERE: Unfortunately British Airways have since canned the direct Heathrow to Entebbe route. As an alternative , look at Kenya Airways, via Nairobi Stay overnight in nearby capital city Kampala, then bus to Kasese (300 km). Driving yourself is not recommended. At Kasese, Overnight at Margherita hotel. 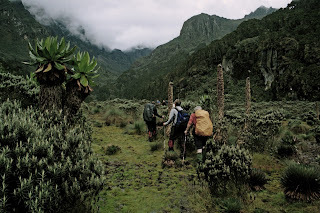 Transfer to the road head at Nyakalenjiga if using Rwenzori Mountain Services guides. Nowadays there is another guiding company to choose from based at Backpackers in Kampala, with a hostel local to the Rwenzori. LOGISTICS: It’s worthwhile joining an organised expedition, whether from the UK or booked with a Ugandan operator who can arrange your pick up from the airport, in country transport, hotel accommodations and liaison with the Rwenzori Mountain Services. Doing it all yourself on this trip probably isn’t worth the money you’ll save. Let someone else deal with the hassle and you’ll then have more time to enjoy the journey. SWEET DREAMS: Hotel accommodation is generally comfortable, if a little dated. On the trek, sleeping is in bunk huts, some with separate rooms. Elena hut is cold, draughty and very basic. HOW MUCH: Once in Uganda, costs are affordable and unlike Kenya where traders start bartering at silly prices, souvenirs are generally good value for money. Tips form an important part of guides and porters wages. But remember that disproportional gratuities can create a culture of expectation as has often been experienced by trekkers on Kilimanjaro. WHEN: The dry seasons in Uganda are from June to early October and late November to early March. But, the Rwenzoris are known locally as the rain maker, constantly filling the Victoria lake system, so expect wet weather at any time of year. WHAT TO TAKE: The peat ground is like walking on a saturated sponge so you’ll need trekking boots with yeti gaiters or Wellingtons to cope with the bogs. Weather ranges from tropically hot and wet to chilly in the evenings. 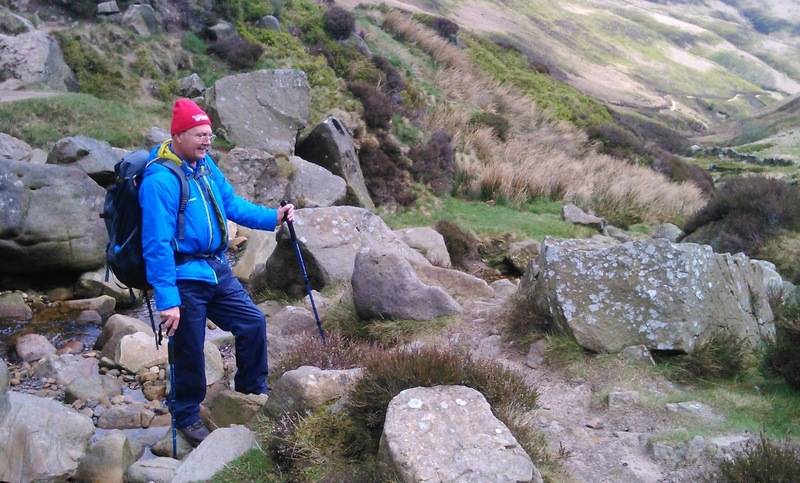 Waterproof over trousers and jacket with light base layer works well for walking. 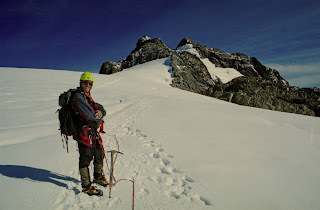 If heading above the trekking circuit, to the peaks: Ice axe, 4 season boots, crampons, rope and harness are required for an attempt on the Mount Stanley summit. Warm sleeping bag. ON THE TREK: Get to know your guides. They’re a great bunch of guys who are a mine of information regarding plants and animals and are keen to share their knowledge. Assuming you have a reasonable level of fitness, there is adequate time each day to cover the relatively short distances between huts, so take your time. A relaxed pace will also help with acclimatisation. Stop and enjoy the views. 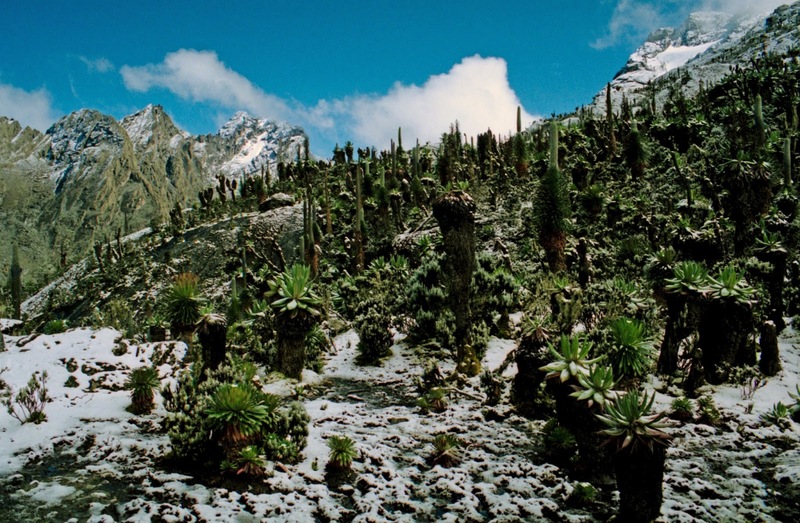 The Rwenzori mountain environment is unique and spectacular. When walking through the bogs, it’s easy to spend all day watching where you‘re treading! At the end of each day, look after your feet by thoroughly drying them and using foot powder. WHEN SCRAMBLING: These remote mountains are not the place to be taking unnecessary risks. With a multiple day stretcher evacuation required before motorised transport can be used to the nearest hospital, the consequences of any accident are serious. 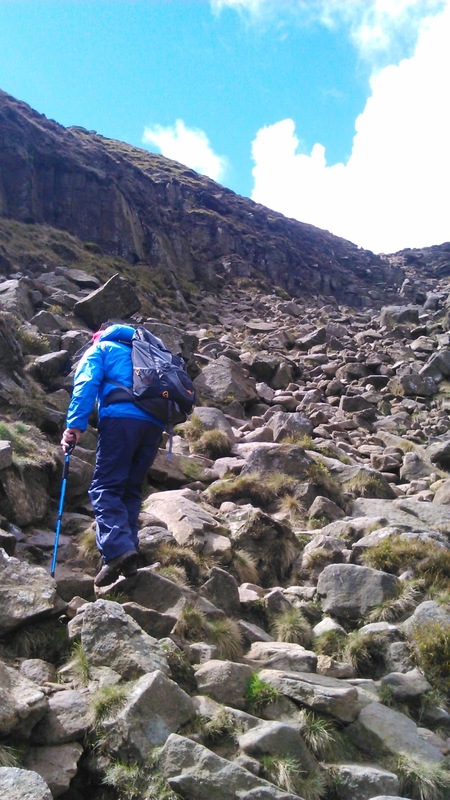 So use the protection of a rope while scrambling and be aware of the changing weather conditions. ADD ON EXCURSION: No trip to East Africa would be complete without a safari. For a luxury treat, wash off the Rwenzori mud at the Mweya Lodge before returning home. Situated in Queen Elizabeth National Park, with stunning views overlooking the Kazinga channel, it is one of the best places in Uganda to view wildlife. Photography enthusiasts and bird watchers will be glad they brought a long telephoto lens (300mm or more). Game drives and boat rides can be arranged by the lodge. Got some extra time (and dollars), head over to Bwindi Impenetrable Forest for Gorilla watching. Or, if you can call the right people, Chimpanzee tracking in Kyambura Gorge. Both are unforgettable and very special experiences. UGANDA POLITICS: Uganda has come a long way since the despotic dictatorship of Idi Amin in the 1970’s. Readers over forty-something will no doubt remember how bad things got from the BBC television news coverage at the time. But as with other war torn African nations, the people of Uganda have shown a remarkable ability to heal their country’s wounds. There are still areas where tourism remains inadvisable, notably north of Murchison Falls, due to the activities of the Lords Resistance Army rebel group and in some border regions with the Congo. However, as important sources of tourist revenue, the Rwenzori and Queen Elizabeth National Parks are well protected. Back in 2014 I conducted a survey into what footwear racers used in the Spine & Challenger Race. The questions I then asked was what they liked about their footwear, what they did not like, and if they were to do the race again what changes they might make to their footwear system (including socks). The respondents were very generous with their answers. However, with a limited sample size, it was impossible to make all encompassing statements of certainty. Indeed, even if such a thing were possible, this was never the absolute objective of the exercise. More importantly was to find trends and share ideas which would be a useful starting point for future Spiners & Challengers, whether new to the race or looking to make improvements. A general dislike of Goretex in low sided footwear, which are easily immersed and water tops over the side of the shoe, turning them into buckets. Many respondents used Salomon footwear, especially Speedcross. Many respondents were surprised as to how much time they spent walking. Most Challengers stayed in the same type of footwear throughout their race. Many Spiners opted to change from low sided footwear to more protected / high sided boots as their race progressed. A major challenge for full distance Spiners was foot care and in particular preventing immersion injuries (i.e. trench foot). This led me to speculate that there might be another strategy: A trail trainer - boot hybrid. A trawl of the internet yielded few choices which were available to purchase at the time. The Inov8 Roclite boot was used to success by some racers in 2014 & 2015. 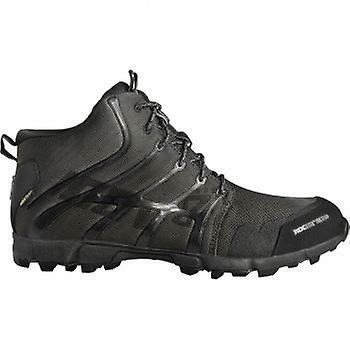 It boasts lightweight construction for running, sticky rubber compound sole for traction on wet rock, high sides for ankle support and Goretex to stave off water ingress through the material of the boot. It's a worthy contender for a Spine race boot, especially if you tend towards minimalist style footwear. Available at £100 to £130, internet prices. However, what options are there for racers who prefer something a bit more substantial without going for heavier boots made for hill walkers? In my work guiding clients, a mountain boot, such as a Scarpa Cristallo, is perfect for the activity. However, for challenge events like the National or Yorkshire 3 Peaks, where pace is faster I found my mountain boots too stiff soled. But my Solomon XA trail trainers were not man enough for the job, especially in poor conditions. This led me to re-visit the similar issue experienced by Spiners. However I noticed a new kid had appeared on the block: Salomon Wings 2. 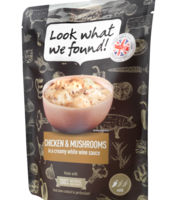 (The original was previously only available as end of line stock). I dithered a couple of weeks before buying because I had read there were Chinese rip-offs of trail shoes on the market. But when the price reduced to a very palatable £99 on Amazon (via Sports Shoes Unlimited), I thought it was worth a punt. On receipt of delivery, initial impressions are good. The boots appear to be well made with no loose end stitches. 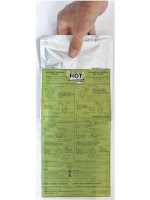 There are stretch gaiters at the heel to help prevent ingress of mud and gravel. Goretex lining adds to the extended season and weather remit of these boots. The sole construction is the usual Salomon 'Contagrip' boasting 'High Traction Rubber' material. The tread pattern is similar to the low sided Salomon Speedcross. The 2014 survey showed this to be a very popular footwear choice especially for Challengers. One reservation I have with all Salomon trail shoes is the seemingly inevitable failure at the hinge point in the toe box. A consequence of pushing the fast and light ethos too far in manufacturing terms, without the material robustness to give the purchaser good value for money. Time will show whether Salomon have addressed this well documented and reported early failure mode. I ordered these boot one size too big. This is partially in response to the fact that Salomon footwear tends to come in small, but also my personal preference is to wear a liner and a thicker sock when out in the hills. The Wings 2 felt comfortable straight out of the box and I was glad of the extra size up. A first short walk confirmed these first impressions and the foot bed has sufficient flex to allow a natural fast cadence. So the question is, are Salomon Wings 2 worth considering as a Spine Race boot? But of course everyone is different and so what is good / or bad for me might be the opposite for the next person. 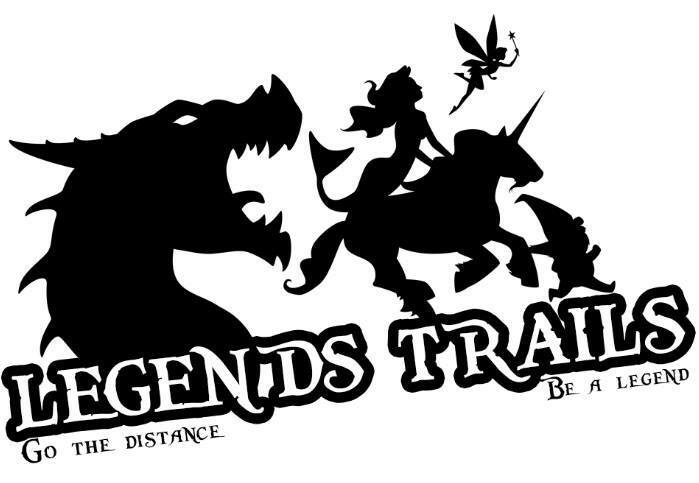 Those who are familiar with the Ranger Expeditions Complete Racer courses, will know that our training and advice aims to equip racers with the skills and knowledge to build a race strategy which suits them personally. 5 years of working on The Spine Mountain Safety Team has shown that expedition skills and navigation ability are of fundamental importance. Also, with worldwide expedition experience in challenging environments and in personal competition we are the Official Provider for Spine Race 1 to 1 and small group training. Spine success is built on a a racer's own strength-in-depth of personal multi-day ultra experience and time journeying in the mountains. The winter conditions have often been brutal and kit selection can also make or break a Spine attempt. 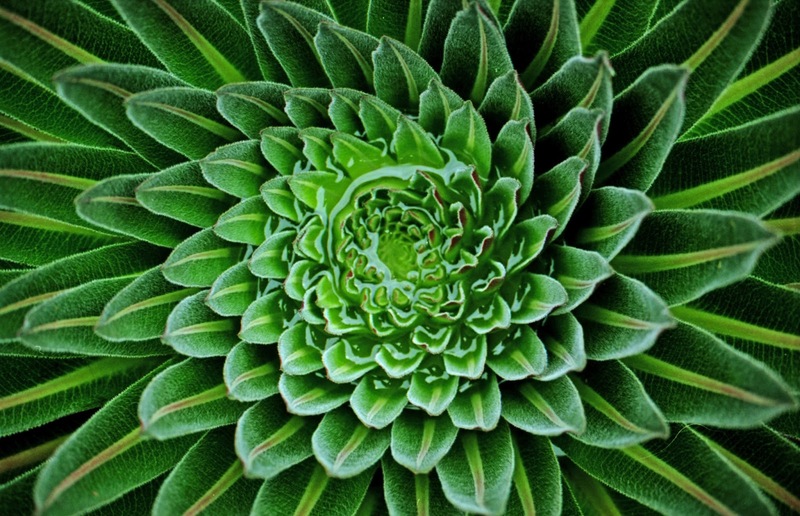 Everything is connected and to be an good all rounder appears to be a essential factor in success. The feedback from our Spine clients is that our training has helped enabled them to address weaker skills, focus on efficiency and detailed aspects of their strategy, to turn a previous disappointment into a finish, or journey further into the race than would otherwise have been possible. #016 Pennine Way 50 Years - "up the old and down the new"
This April saw walkers gathering in Edale to celebrate 50 years since the inauguration of the Pennine Way. 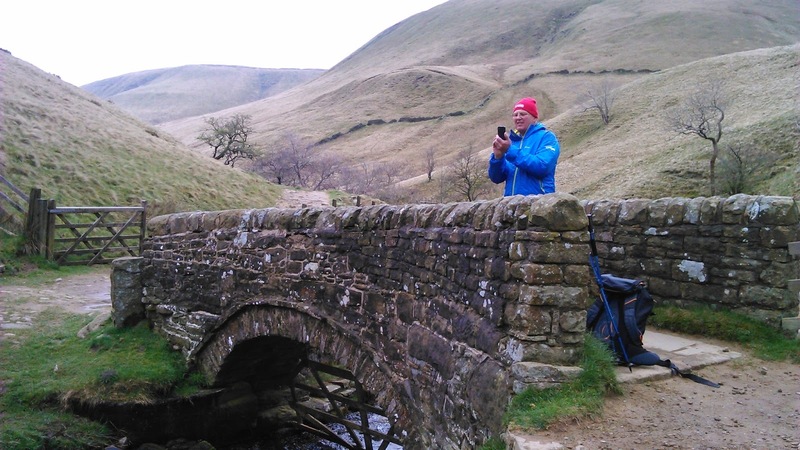 It is amazing to think that in this time it has become probably the best known of all the national trails in the UK...And for the past five years the route has hosted a world class winter endurance event, The Spine and Spine Challenger race series. 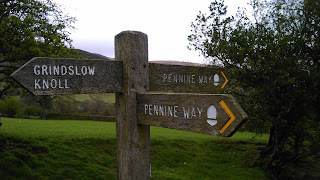 Inspired by similar trails in USA, particularly the Appalachian, it was the dream of Tom Stephenson to connect up the various footpaths along the watershed to the Pennine hills running from the Peak District to Kirk Yetholm on the Scottish borders. Originally proposed in 1935, the final section was declared open in a ceremony on Malham Moor on 24th April 1965. The plans for the scheme were displayed in the Edale Peak Centre for the silver anniversary. It was interesting to note the various proposals as well as subsequent modifications, such as the bad weather route (& now preferred start) across fields to Upper Booth, ascending Jacob's Ladder. The original reason for this change was due to concerns about erosion, but an additional benefit was fewer inexperienced navigators getting lost among the peat hags and trenches of the central Kinder plateau, in the frequent hill fog. Peter Lowton, myself and Rafa dog from Ranger Expeditions set out from Edale to mark the occasion. Coincidentally, the date also marked 15 years since I broke away from salaried employment into the world of the freelancer. My previous career in the highly regulated aerospace industry culminated in a safety role, investigating non conformance, gathering evidence and ultimately sanctioning equipment as fit for flight use. The experience gained has since been of invaluable use in my work as a mountain and expedition leader. Where assessing risk and implementing proportional control measures is an every day part of the role. But this is done in a way which does not detract from the essence of adventure and personal challenge which draws many people to the hills and mountains. Sharing this approach along with quality training, helps clients learn to dynamically assess risk when enjoying their own independent journeys, preventing adventure from becoming mis-adventure. A drizzley start to the morning soon cleared to bring blue skies and warmth to the Spring day. 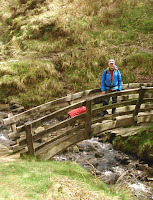 We headed up Crowden Clough, the original PW route, crossing the brook using a footbridge constructed by local master craftsman Robin Wood MBE. We would pass by Robin's workshop later on, during our descent. His projects include making authentic replica bowls for the Mary Rose museum in Portsmouth, Jorvik Viking Centre and Ridley Scott's 'Robin Hood' among others. This early in the season, there was still a healthy flow of water off the plateau and so we boulder hopped across the brook several times as we walked and scrambled upwards. We paused for a snack on a grassy patch about the 450m contour and to take in the view. Towards the top steepest section, Rafa's legs were tiring with jumping upwards, so I gave him a hand up with an extra lift on his body harness. Once at the top he seemed to quickly regain his enthusiasm to be investigating what lay ahead. One chap in group of passing wakers recognised Rafa and paused to chat. 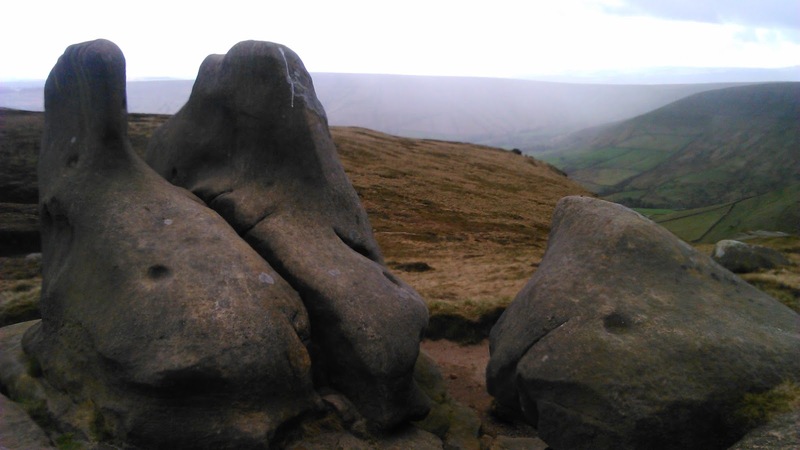 I then recalled meeting him and his septuagenarian friends a few months earlier when they were out on another brisk jaunt over the Kinder. We followed the plateau edge in a clockwise direction, passing Crowden tower, avoiding the southerly diversion to the hill spur above Upper Booth. 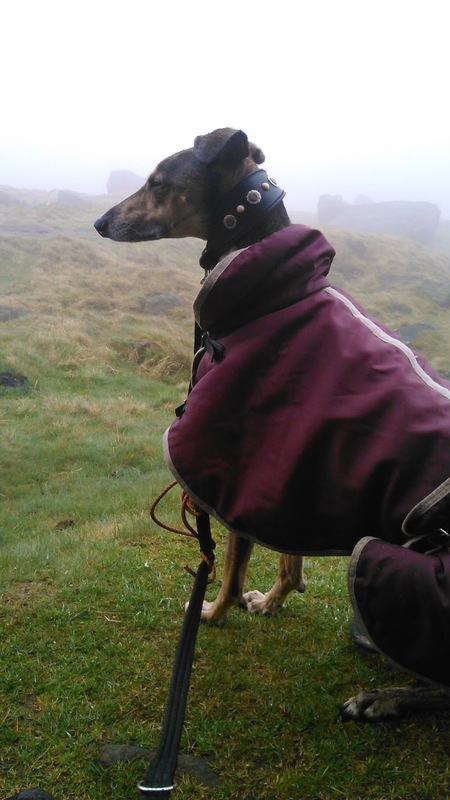 By this time the clouds were descending and beginning to shroud the hilltop in mist. We were stopped by two silver DofE groups, unsure of their exact position and asking for reassurance that they were still on the right track. In the circumstances, both were within a couple of hundred metres of where they thought they were. But it shows how disorientating hill fog can be to the navigator. Possibly of greater concern, where the adult groups we had seen earlier in the day. 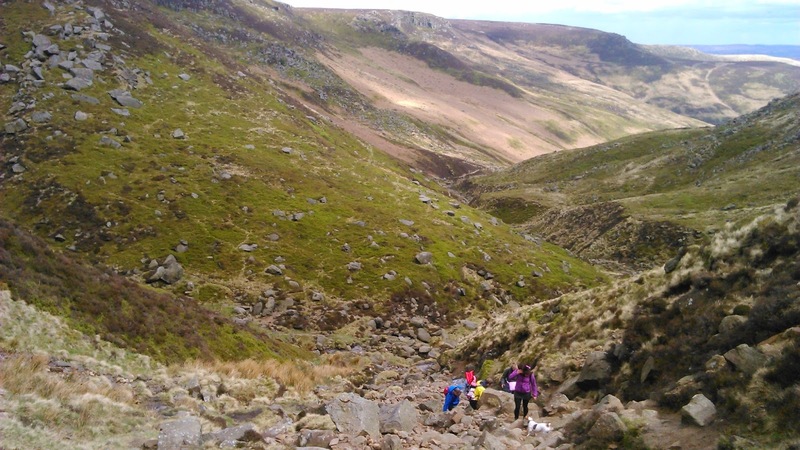 Dressed in t-shirts and shorts and voicing their confusion whilst following the very well defined Crowden Clough in clear visibility. 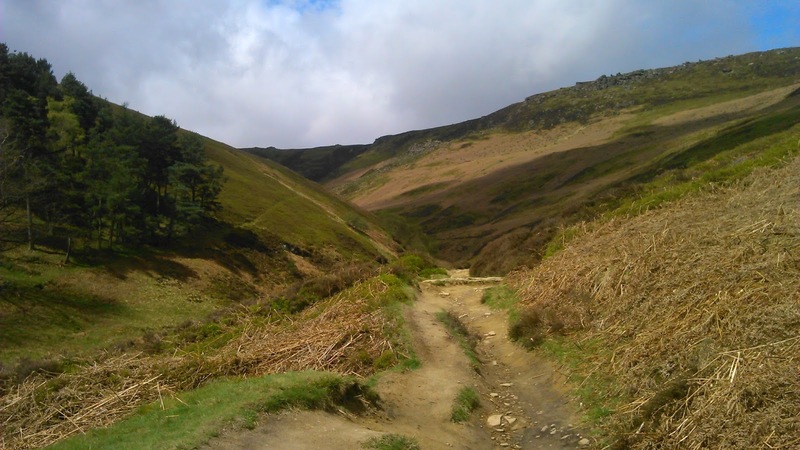 The enjoyment of the hills is there for everyone, but a few hours hill skills training is a wise investment which, along with some basic waterproof gear, does not necessarily need to break the bank. 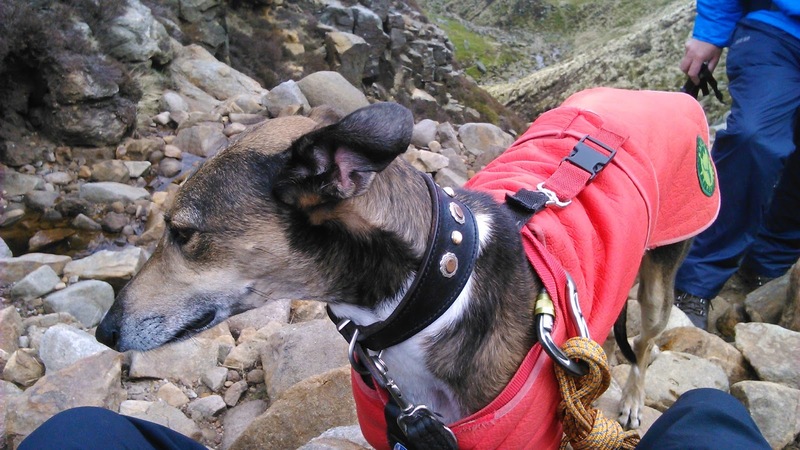 It could mean the difference between a thoroughly enjoyed walk and a call out to the local mountain rescue team. We passed by fascinating rock formations with names such as The Wool Packs, Noe Stool and Pym Chair. 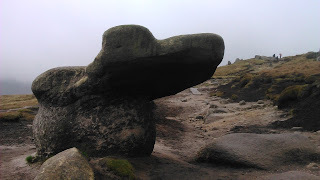 Shaped by the last ice age and weathered smooth by wind and rain over millennia. 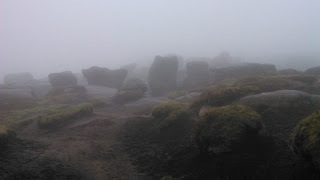 As I approached one collection of rocks, shrouded in the mist, they appeared to me as a circular henge. Having spent time investigating stone age sites from Malta to Orkney, I felt sure the significance would not have been lost on our Neolithic ancestors. Clouds were now billowing up over the plateau edge and we spotted a dark squall rapidly moving in from the west. 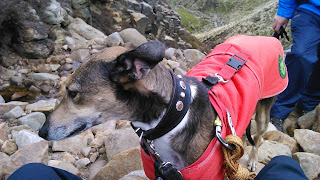 I 'double bagged' Rafa with his rain jacket and rapidly pulled on my waterproof trousers just as the first heavy spots splashed on our rucksacks. Sheltering in the lee of a boulder it was soon apparent that this was a prolonged shower as rivulets formed in the gritty sand underfoot. Instead of standing around waiting to get cold, we continued briskly onward. With a minor deviation we headed directly to Edale Rocks where we tucked into the last of our sandwiches in the shelter of the over arching rocks. We were not far from the Kinder Low bronze age burial mound. People had most likely been using this as a place of refuge for 3500 years, probably a lot longer before that. 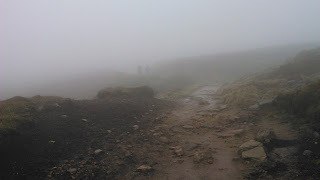 Descending Jacob's Ladder, we dropped below the cloud base to see several other groups of walkers now making their way off after their day on the hill. 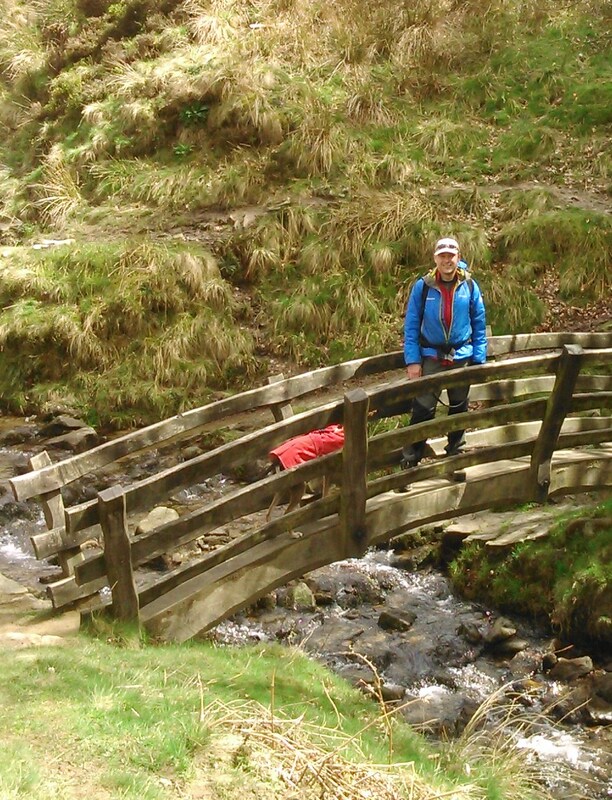 We removed our rain jackets at the pretty packhorse bridge over the River Noe. A couple more kilometers traversing fields, full of sheep with new lambs and Rafa on a short lead, we arrived back at Edale village. A coffee at the Old Nags Head was in order, as well as a cheeky measure of Lagavulin to celebrate a grand day out. With healthy appetite, a visit to the Edale Wood Fire Pizza Company marked a delicious end to the day. 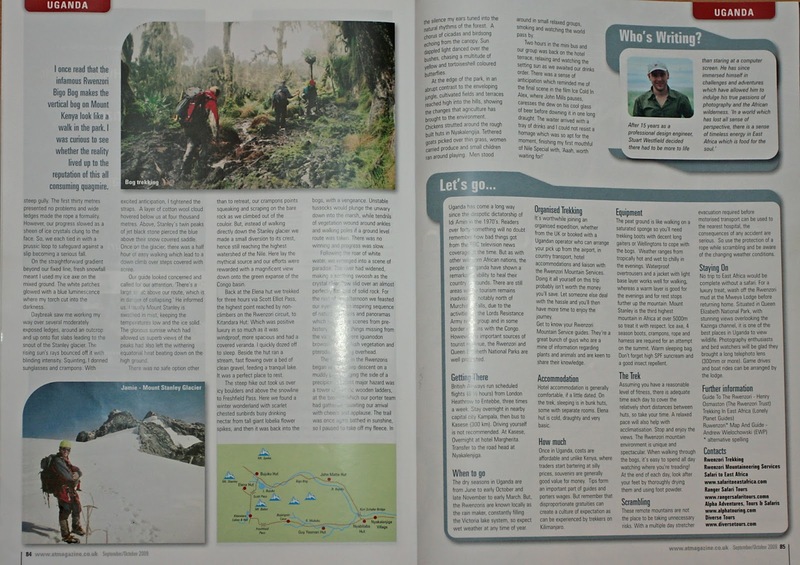 Navigation, hill & expedition skills. Ultra marathon - The Spine Race, with our Ranger Expeditions 'Complete Racer' training courses.